The auroras have always been a sight of beauty and wonder that has captivated us throughout the ages. From myths and legends to science, we have pondered their existence and try to grasp their meaning. From the spirit of the dead to gods moving across the sky, many people held their own mythology of what the auroras could be. The aurora borealis and the aurora australis are the two most common auroras that people imagine when we think about the auroras. Every year, many people flock to regions where they could get a glimpse of these natural wonders. The northern and southern lights can extend further south or north into regions where it rarely occurs. This is one of the reasons that people of France used to think that the northern lights were a bad omen. However, there are other auroras that occur around the globe and are not part of the two common ones. 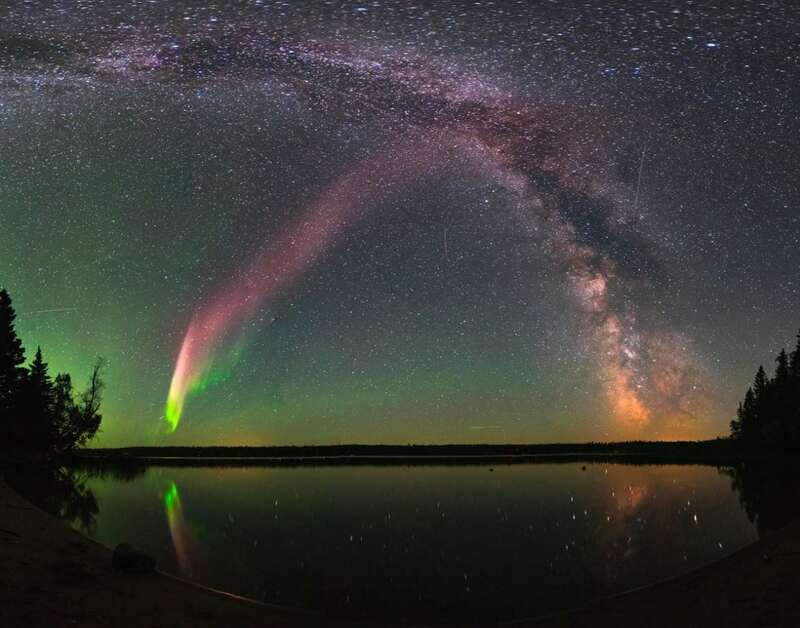 Citizen scientists and advancing technologies have allowed us to uncover a new form of Aurora called “Steve.” This new discovery represents the power of using the community and their desire to help add to our collective knowledge as well as the powerful tools we all carry with us nowadays. The two auroras are the visual representation of what is happening with Earth’s magnetic and electric fields. As the solar winds interact with the Earth’s magnetic field, strong electrical currents are generated throughout the magnetosphere. These currents accelerate charged particles and they travel into the upper level of our atmosphere. In the upper levels of the atmosphere, they collide with gases. The collision eventually results in the release of energy via photons that give off the fluorescent light at the poles of the magnetosphere that makes up the northern and southern lights. Now, more energy that is created results in larger auroras that expand further beyond the poles. The auroras appear in a variety of different colors based on the atmospheric level they occur on, the amounts of gases, and the different kind of gases. The green color is the most common and occurs at relatively low altitude with a high concentration of oxygen. Other colors include red, blue, yellow, and pink. There can also be ultraviolet and infrared. Dedicated aurora chasers in Alberta, Canada had gone on an adventure in the middle of the night to take pictures of the sky and whatever beautiful things it contained. As they traveled south, they encountered a new kind of Aurora. This was a narrow band of purple light that arched up into the sky. It appeared as a ribbon of dancing purple across the night sky. This all occurred during 2015 and 2016 as the citizen scientists continued to track and monitor “Steve.” This new Aurora has also been seen around the globe in places like New Zealand, parts of the United States, and even Scotland. Being a new discovery, it quickly caught the attention of scientists. Elizabeth MacDonald and her team took up the task to understand this new phenomenon. The team used the European Space Agency’s Swarm Satellites to observe “Steve” as they sent it through it. They found that the aurora was formed through the acceleration and heating of charged particles that came from the sun hitting the magnetic field in the ionosphere. Having become fond of the name, MacDonald and her team used a backronym, Strong Thermal Emission Velocity Enhancement, to ensure that the name remained STEVE. According to the researchers, STEVE is unlike other auroras we have seen before because it is a subauroral ion drift. The event is happening much further south than where we would imagine a typical aurora would be. At about 60 degrees above the equator, the electric and magnetic fields of the Earth make ions and electrons flow in an east-west direction. This flow occurs very rapidly and heats up the associated ions and electrons. As they heat, they form the striking arc that composes of STEVE. The researchers have found that this is a seasonal event that stems from space weather. This gives scientists a new way of observing how the solar winds and particles of the sun interact with Earth. Citizen scientists are an important part of how we learn new things about the world. There are numerous events that we have yet to observe. With many eyes and new technologies exploring the unexplored, we are beginning to see new discoveries because of people’s curiosity. MacDonald and other scientists will be continuing to study STEVE and understand this new Aurora. They hope that citizen scientists will continue to explore the world and help them. MacDonald hopes that as they continue to explore, they will find other auroras in different regions so that scientists can gather more information about where and how high up these events are. To that extent, MacDonald has an app, Aurorasaurus, that citizen scientists can download and use it to collect locations of auroras and alert people them. STEVE represents one of the many successes of citizen scientists as they helped to connect a new finding with the people who have the tools and resources to understand them. This is an excellent example of you anyone can contribute to the advancement of our collective knowledge simply by following their curiosity and exploring the world. There are other citizen scientist programs like SETI, which aims to use the collective processing power of computers across the globe to analyze images taken of the universe. There are also programs where the general audience can even help to identify exoplanets and other celestial bodies. As our technologies become better at capturing the world around us, we can continue to help scientists understand the world even if we do not yet understand it ourselves.